Despite scoring 67 points, Gameweek 13 was a mixed bag - Deulofeu blanking, losing out to a Chelsea clean sheet (as Azpilicueta was benched), Rojo and Hennessey conceding late but with Kane (c) coming good. This led to a semi-decent green arrow. Momentum, at last. Aguero's goal against Liverpool put him back on my radar. But I'm not convinced that he's 100% match fit as he hasn't played an entire match of competitive football since his return. In addition, as all of my strikers scored I have no intention of selling them for a hit by also offloading de Bruyne or Sanchez. 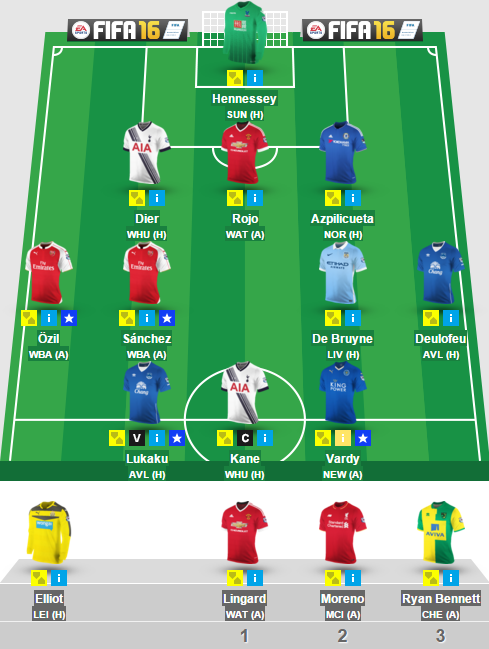 I thought it best to save my transfer with a view to purchasing Aguero in Gameweek 15. I suspect that Vardy's form will hit a brick wall as his fixtures become tougher, so I may potentially sell him if Aguero totally eclipses him. I was tempted to captain Sanchez v Norwich after his two goals and assist in the Champions League - but he may have picked up a slight injury. Ozil also seemed viable, but the truth is that Norwich have only conceded 4 goals in their last 4 games. Kane may be a bit knackered after his excursion to Azerbaijan on Thursday. The only real choice is the in-form Belgian, Lukaku, against a woeful Bournemouth team. Folks, it's back! In conjunction with fantasyfootballfix.com, I am pleased to announce that we are launching another edition of our Battle Royal competition. This will be bigger and better! Of course, "Battle Royal 3" is an unofficial game and has its own rules. 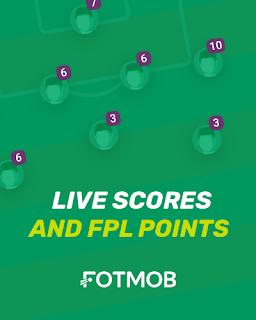 If you recall from the first and second Battle Royal editions it is essentially a list-style weekly knockout competition, dependent on your FPL score for the week. The same principle remains true - scores will not roll over. They will be reset for each Gameweek. In addition, fantasyfootballfix.com is provisionally scheduled to offer prizes to the winner. 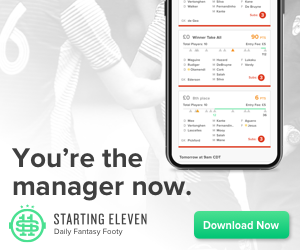 Please also note that the tie-breaker for those on same points for a particular Gameweek will be confirmed and verified by fantasyfootballfix.com. Duplicate entries are strictly forbidden and we reserve the right to remove such teams. You can only enter one team into this competition. Round 1 - GW14 - Competing for Top 300 slots. Round 2 - GW15 - Competing for Top 200 slots. Round 3 - GW16 - Competing for Top 160 slots. Round 4 - GW17 - Competing for Top 120 slots. Round 5 - GW18 - Competing for Top 60 slots. Round 6 - GW19 - Competing for Top 10 slots. We will not accept any new entries after the specified time. We reserve the right to amend qualification (or any rules) subject to reasonable circumstances. We also reserve the right to terminate this competition at anytime. If you require clarification on any of our rules, simply contact us via Twitter. In addition, round-by-round score updates will be generated via fantasyfootballfix.com as and when they see fit. Last year's leaderboard and scores can be found here. F O R M I S K E Y. C L A S S D O E S N ' T M A T T E R .
I finally activated my wildcard during the international break and here are the results. Many players were considered that didn't make the cut, i.e. Alli, Coutinho, Cech, Giroud, etc. I was adamant on not buying Aguero despite Vinnie's strong case for him on this week's show. My Gameweek 13 captain was a straight choice between Lukaku and Kane. I opted for the latter as Bilic's team concedes goals, where as Villa's defence will get tougher to break down under Garde. Begovic - He wasn't part of my GW1 team. I only bought him in by selling Cech so that I could save funds, but in turn I lost out on points. I guess I should been worried when Begovic conceded 4 during a pre-season game. He's no Courtois. He's no Cech. Yes, I expect Chelsea to keep more clean sheets in the weeks ahead but there are better keepers around. Huth - The fact he was £4.5m, a regular starter and had a history of scoring goals in the past gave me some hope. In truth he's not really been involved in Leicester's attacking play and has conceded regularly when the likes of Cathcart haven't. I can't see Ranieri parking the bus any time soon, can you? Wijnaldum - I bought him in straight after his 4 goal haul. I rarely buy NUFC players and there's a reason why, they're simply not consistent enough. He is by far the Geordies most talented player, but Deulofeu offers far more promise (at a lower price) in the weeks ahead. Payet - It's a shame he got injured. Then again, his returns diminished in the last two Gameweeks. I'm glad I sold him early with my wildcard, his value has fallen by £0.3m already. West Ham may also struggle to score goals without him. Mane - He scored 10 goals in the Premier League last season and was showing a similar ratio pattern this season. But blanking against Bournemouth when I captained him was simply unforgivable. He's still good, but I wanted Ozil who has been far better. Graham - He was a dud sub3 and did his job superbly in that role. 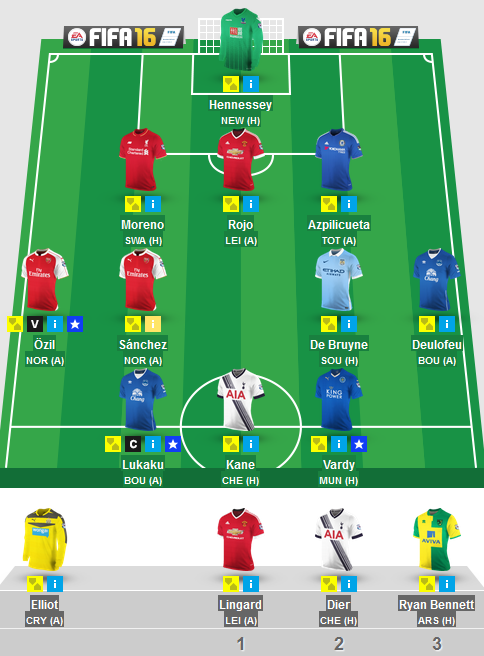 But with the December fixture jam approaching I need a beefed up bench so he had to make way. Cedric - I thought I was on to something when I bought a Saints defender for £5.0m. Unfortunately, others like Fonte and van Dijk have outdone Cedric even when conceding goals. The fact he also gets rotated occasionally didn't help his cause. Dier, Moreno or Rojo offer so much more value. Oxford - He was always meant to be a dud sub in my team. Alas, his Gameweek 1 heroics were wasted on the bench. The hype and bandwagon finished fast. The likes of Ryan Bennett make more sense if you want a £3.9M defender. Dier - The fact he is £5.2M, playing out of position for a Spurs team that has been unbeaten since Gameweek 1 could no longer be ignored. Granted, they could have kept more clean sheets. But I think he offers something in his dynamism and I am happy to bench him when he plays away or against difficult opposition. Azpilicueta - I am fully aware that Chelsea have been dire this season. But in FPL terms he has been their best performing defender. With a good run of upcoming games, I think he will be key for Chelsea - he possesses proven defensive and attacking prowess which makes him an exciting FPL player. At less than £6M, you can't go wrong. Can you? Ozil - I had him earlier in the season and then ditched him for Sanchez. Ozil assists for fun. When he's hot, he's hot - this is one of those periods. I think he's also due a goal soon enough. I couldn't bare to sell Sanchez just yet, which is why I am content on having both for now. Ozil is the engine to Arsenal's attack and can take a mean free kick too. Here's to hoping. Deulofeu - It made sense to source Everton coverage with their scintillating run of upcoming games. The young Spaniard has certainly promised of late and even eclipsed Barkley. His quasi-forward attributes will ensure that he will be a potent attacker with a sub-£7m price tag. Rotation may be a worry, but why would Martinez rest him now? Lukaku - At one point in his career he had one of the best minutes:goals ratios in Premier League history. Yes, the Belgian can blow hot and cold. But when he has form on his side you have to give him strong consideration. Don't be fooled by Kone and Naismith, Lukaku is Everton's real striker and is simply awesome on his good days. Elliot - I didn't buy him for his clean sheet prowess. I wanted a cheap keeper that plays first team football and can act as cover for Hennessey. To put it mildly, Elliot fitted the bill. I may start him for the odd game here and there, but in his essence his purpose is to warm the bench without getting too many points. Lingard - In a season where United have struggled to score goals. He could be the answer to their woes. I don't expect him to start every single game. But seeing as United have injury worries up top and are lacking goals, he makes sense. The clincher is his £4.5M value. I would only start him if I think LvG has confidence in him. For now, he's good sub1 material. Moreno - He was on my radar in preseason, but with the short-term Gomez bandwagon I totally forgot about him. At £4.8M and starting regular matches under Klopp, he's become a gem with his all-round ability. Like Dier, I would only start him against easier opposition. Liverpool's run between now and end of December is good so it's best to hop on him now. R Bennett - It seems that whenever Norwich get promoted to the Premier League, he somehow ends up into my team. I still remember him for his legendary 15pts during an extremely low scoring Gameweek. Nostalgia aside, He's good sub3 material - £3.9M and starting matches but unlikely to score a lot. He's no Reece Oxford, that's for sure. Rojo - Doesn't cost a lot and starting in a United team that keeps clean sheets. Sanchez - He's been wayward of late, but his explosivity in FPL is second to none. de Bruyne - Like Sanchez, he too has gone a bit cold, but he is class. Kane - Back to scoring goals. He will probably be sold once Aguero outscores him. Vardy - He can't stop scoring and everyone owns him. There's no reason to sell. Hennessey - He easily outscored Begovic, yet I never gave him a chance - well, he's duly been promoted! Is Rooney "Dier" & Aguero up your "Alli"? Feel free to follow FanFeudPodcast on Twitter! 1993 is a year that I have many fond memories of: My first ever cinema visit; Jurassic Park at the Cannon, Northampton. I’ll always remember it as I got smacked really hard on the bum by the old man for doing a ‘silent but violent’ fart on the front row (to his credit he did wait until we were in the foyer afterwards), Bruce Grobelaar’s rat tail, Andy Sinton, Chris Bart-Williams, Darren Caskey and Carlton Palmer being selected for the England national team, Norwich City beating Bayern Munich in the Olympic stadium and best of all finding my old man’s stash underneath the drawers in his bedroom (it was moved many times after that but me and my bro always managed to locate it). One thing I did not remember, however, was a game requested by @FPL_Fly for this week’s Vintage Values, the match in question was Everton v Sheffield United. It was early in the season (August) and Dane Whitehouse bagged in the first minute (which, according to @GriftersUnited, earned Dane a Watch which he was presented with before the Blades next home game). With goals being scored in the 1st, 89th and 90th minute this was another edge of the seat contest with Everton coming out on top. The win took the Toffees to 3rd place in the table. This was, however short lived as this was the season when they appointed the in vogue Mike Walker from Norwich City. Everton scrambled to safety on the last day of the season when Wimbledon Goalkeeper, Hans Segers, threw one of Graham Stuart’s pea-rollers into the back of his net. Sheffield United were relegated in 20th position (this was back when there were 22 teams). Once again if you have any memories of this game or the 1993/94 season in particular please feel free to reminisce with me. If there is a game you are gagging to relive send me a request and I’ll add it to my ever increasing list. Although I don’t have great memories of the Everton v Sheffield United game, I’ll never forget those Readers Wives!